So we have a date at long last. The 23rd June will be the day the people of the UK decide to either stay in or get out. Battle lines are being drawn, both political and astrological heavyweights are throwing their lot in with one side or another. Up to now Capricorn Research has stayed on the fence. This is not due to some Boris Johnson like quality of veering from one side to the other like some sort of manic shopping trolley. Of course Boris has his own agenda of wanting to become the next PM and has to consider which decision would best further that objective. He also has 4 planets in Gemini, so changing his mind is what he does best. The Capricorn approach is also calculating but in a more considered way. This sign wants to research it all thoroughly before coming down on one side or another. So I have taken the opportunity to read several offerings from esteemed astrologers, many of whom are predicting a Brexit and some are sticking with the status quo. The case for Brexit appears to focus significantly around the planet Uranus and the 23rd degree. So the obvious place to start is with the chart for the Brexit referendum. This chart is very interesting. With both the Sun and Rising sign in Cancer, it shows the main issue. It is about our homeland. Cancers have a tendency to draw tight boundaries around themselves and feel secure as long as they operate within these limits. The Moon is in the sign which sees no boundaries at all, Aquarius and also in the 7th house of partners so symbolising the ideals of the EU. Mercury is in Gemini in the 11th house of politics. This could be seen as the opinions of the people which in this sign are constantly changing. Mercury is also part of a Grand Cross in opposition to Saturn and square to both Jupiter and Neptune. This points to the major issue that concerns people and the tensions and arguments that it creates. Jupiter, Saturn and Neptune have been involved in a Mutable sign dance since last summer. One of the main results of this has been the refugee / migrant situation / crisis. Saturn’s sign placing will often indicate where society sees its problems or enemies. Whilst it was travelling through Scorpio ( October 2012 – September 2015 ) the focus was on sexual abuse mostly generated from the case of the late Jimmy Savile. This began as Saturn went over Savile’s Sun. Saturn’s progress into Sagittarius beginning at the start of 2015 has seen a change in focus. The problems are now seen to be religious extremists as in ISIS and also migration, both Sagittarian issues. All of a sudden, the world’s biggest problem was immigration. But this was relatively simple for the Tory government to deal with. They were against it. However they were all caught on the hop when Jupiter opposed Neptune in September last year, as the picture of the drowned toddler generated a wave of sympathy for refugees and an extraordinary back pedalling by David Cameron and his mates. It didn’t last. Jupiter moved on and compassion for refugees was again replaced by resentment of migrants when Saturn squared Neptune through the Autumn. So the fact that Mercury is in a Grand Cross with all three of these planets shows the confusion and tension around this issue to be the most important in the decision to stay in or get out. This chart describes the situation around the referendum very well but it doesn’t yield a result. Annoyingly Cancer is rising, which makes the Moon the ruler of the chart and it would therefore signify the holders. In this case you would have to say that was the group wanting to stay in. The fact that the Moon is in Aquarius in the 7th ( no borders and equal partners ) shows that to be the case. The trouble is the clearest indicator of a result in an election chart is the Moon applying to an aspect to the Ascendant ruler or Descendant ruler. When Cancer is rising or setting this method of judging a result becomes defunct, because the Moon can’t apply to itself. So what else do we have ? There’s Mars and Uranus in an awkward inconjunction at 23 degrees of Scorpio and Aries. This suggests that there is going to be a fair bit of bad blood spilt over this referendum. Uranus in the 10th also could suggest serious change to our political structures. So does this chart suggest the end of UK’s membership of the EU ? Well astrology is all about beginnings, those seed moments like the birth of a child and we get to understand the life of that person by observing the interplay of transits with that natal blueprint. So we should look at the chart for Britain’s entry into the EEC in 1973. This is an extraordinary chart. The Sun is in Capricorn, but we can discount the importance of that because new institutions often start on January 1st, so the Sun will always be there. The Sun is conjunct Jupiter and the Moon is part of a 5 planet stellium in Sagittarius. This is a remarkable expression of the breaking down of old boundaries and an expression of outward focus, joining forces with other countries abroad. The Libran Ascendant shows the attitude of cooperation and the Pluto conjunction to it points to what a revolutionary move this was for the UK. However there is a indication that there will be problems for the future. Venus the ruler of the chart is in Sagittarius opposite Saturn in Gemini in the 9th house. This is almost a recognition that the free movement of people through Europe ( Gemini / 9th house ) will be seen as a cause of trouble ( Saturn ) for the UK ( opposite Venus ). So how does the Brexit chart match up with this one ? One fascinating thing about the Brexit chart is the Grand Cross showing the public’s concern about migration fits exactly onto the Venus / Saturn opposition in the 1973 chart. All of the Sagittarian / Jupiter optimism of 1973 has evaporated now and the one thing that is focused on is the essential problem of lack of borders. Another interesting thing is the relative positions of Uranus. When Britain went into the EEC Uranus was at 22.45 Libra, in itself an expression of change and cooperation. For Brexit it is exactly opposite at 23.58 Aries, again a desire for change, but very much to go it alone. So both Saturn and Uranus are opposite their natal placings. Astute readers would point out that this happens to everyone somewhere between the ages of 42 and 44, and it creates a condition known by everyone, astrologers and laymen alike. This is commonly called the midlife crisis. It seems to be particularly prevalent in the male of the species and is often characterised by a roving eye and a desire to trade in the old wifey for a new young blonde model. So Britain’s entry into the EEC is slap bang in the middle of its very own midlife crisis. Images come to mind of that Arien, Nigel Farage riding his spanking new Harley Davidson down the M4 whilst complaining of the traffic jams caused by all these migrants. Much of the focus around the question of leaving the EU is on what it means to be British. And given the fact that the majority of Scots, Welsh and Northern Irish want to stay in the EU partly because they benefit from a wide range of subsidies, the question is therefore largely what it means to be English. And this question can be simply summed up astrologically. The chart for William the Conqueror’s coronation has long been considered the base note for the English character. It also marks the last time we allowed some foreigner to dominate us, so it appears to be a perfect reference point for the Brexit issue. Much has been written about the reserved, stiff upper lip Capricornian character, but also the 12th house Piscean Moon shows that the English instincts are strictly of a withdrawn, isolationist manner. We are after all a very small island stuck on the edge of somewhere. 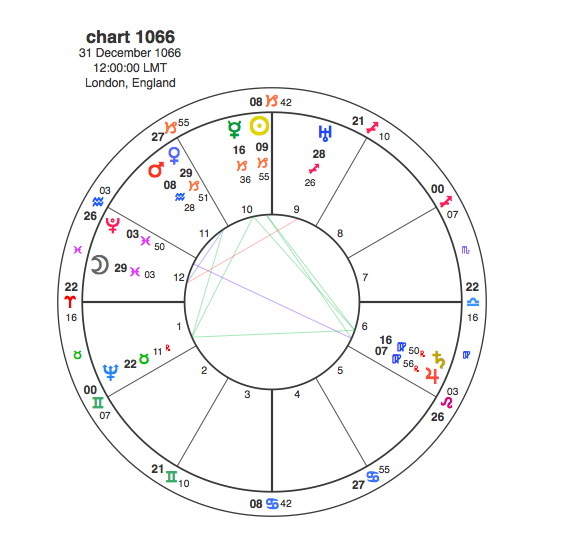 However this Moon is very closely square to Uranus in Sagittarius in the 9th house showing that we are constantly plagued by the question of what to do about Johnny Foreigner. The Aries Ascendant signifies someone who is confident in their own actions, but would also much rather just get on with things on their own, without having to cooperate with others. Mercury in the 1066 chart is at 16 Capricorn in exact trine to Saturn, which shows that English know exactly what they think about everything, even if those thoughts are fairly predictable and uninspiring. 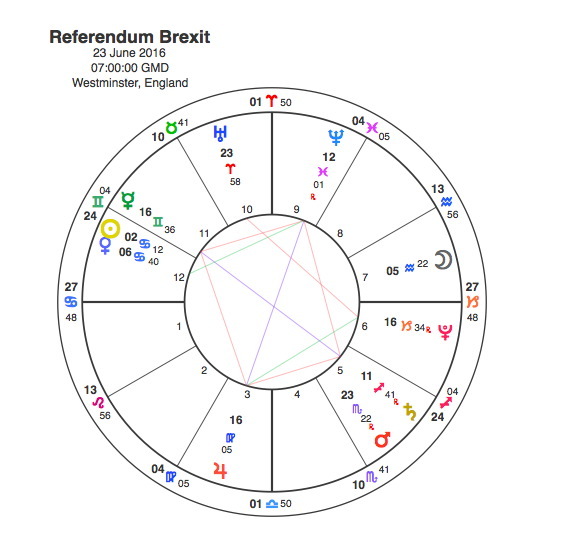 So the Brexit chart with Mercury in Gemini opposite Saturn suggests an uncertain state of mind that we’re not used to. In 1973, when Britain went into the EEC, Uranus was not only in Libra but exactly conjunct the 1066 Descendant, signifying an unprecedented spirit of cooperative endeavour. June 2016 sees Uranus conjunct the 1066 Ascendant, which suggests a return to type. While the 1066 chart works as a good description of the English character, many people would suggest that it is not the one most relevant to the politics of the UK. Usually the chart referred to in this case is that for the Union of Britain and Ireland in 1801. 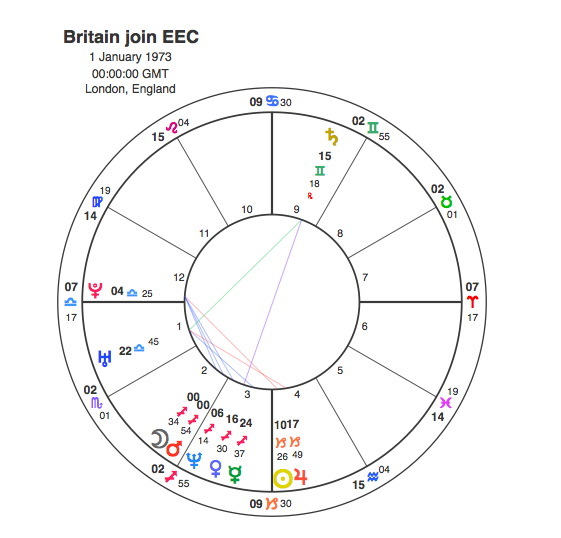 Astrologers working with the 1801 chart have suggested that the UK will stay in the EU because there is nothing of note occurring in transit to it. However there was very little occurring in this chart when the UK went into the EEC either. Some might suggest that the appropriate chart for the UK would be the one when the country was reconstituted after the Republic of Ireland gained independence in 1922. If so Saturn is currently conjunct the Sagittarius Sun of that chart which might make a case for Brexit. Also the Moon of that chart is at 23 degrees Cancer. This means that Uranus was square to this Moon when the UK joined the EEC and is also square to it this June. This is all quite persuasive so far. It looks like many of these charts are pointing to the exit. But what about the transits to the leaders of the ins and the outs ? Of course this is not the same as looking at a General Election to see who is going to be Prime Minister, but since David Cameron has hitched his wagon so strongly to staying in, it is worth looking at his chart. .I have heard it mentioned that as Pluto is square Cameron’s Sun, this could be another argument for Brexit, but I have to dispute that. This transit is a peak one for Cameron and it is the main reason why I predicted that he would win last May’s election with an outright majority. In September this year, Jupiter goes over Cameron’s Ascendant and it will be conjunct his Sun for much of the period from November to July 2017. 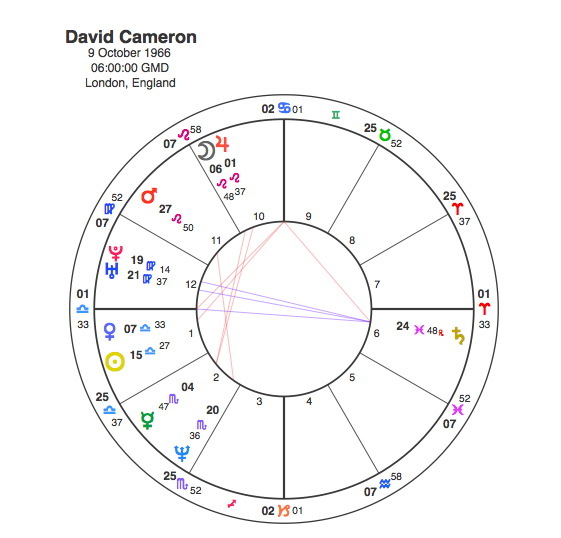 Given that Jupiter has such an elevated place in Cameron’s chart its hard to see this being anything but a very auspicious time for him, particularly as the last time it transitted through Libra he was elected Tory leader. If the Brexit referendum produced a vote in favour of leaving, Cameron’s position would be seriously weakened. He has already said that he won’t stand for a 3rd term, but a vote to leave the EU could well hasten his departure from No 10. Even if it didn’t, his standing would drop considerably, something that just doesn’t happen when Jupiter is conjunct your Sun. It might be said that Jupiter is nowhere near Cameron’s Sun in June, its not even in the same sign, so this transit is not relevant to the Brexit vote. However when looking at a person’s life you have to see it as a continuous whole, not as a series of disconnected transits. It is true that the positions of Uranus and Saturn relative to the 1066 chart and the EEC entry chart do suggest an exit from the EU, but they could equally refer to the fact that such a move is just being considered and voted upon. Its often claimed that astrology says this or that is going to happen, but this is never the case. Every scenario has some astrological pointers that might suggest one thing and some that could suggest something else. The astrologer has to weigh all these up and decide which factors are going to prove to be most significant on the day. Its a bit like weather forecasting. In the old days they used to just say it will rain, now they will talk about a 70% chance of precipitation. My feeling, having looked at it from as many sides as I can think of, is that there’s a 70 % chance of staying in, and the UK’s EU mid life crisis, is like it is for most British males, just a blip. After all when you’re in your mid forties the reality of riding around on a Harley Davidson on British roads is that its a bit cold and more than a little dangerous. I think in the end the fear of the unknown will persuade most of the don’t knows to stay in.